Thai people are well known for their tolerance and hospitality. For a normal tourist it is easy to customize with Thai society. You as a guest in this country should know what to do or better not to do. Having the necessary information you can avoid behaviour that is normal in an European country, but can hurt or offend a Thai person. To customize with Thai society means basically to use his own "common sense" and to be friendly. In the following lines you can find some information and behaviour tips for travellers in Thailand. Thai people avoid confrontations by conviction. This is the reason why travelling in Thailand is such a pleasure. Rash actions are forgiven and forgotten rapidly, you will maybe not recognize it at all. 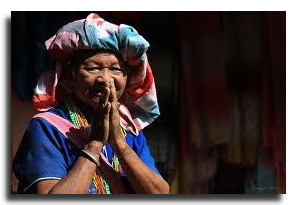 Thai know that tourists have their own traditional behaviour and habits and tolerate it. But you can go a step further and inform yourself about Thai behaviour before the journey begins. Thai adore their Royal Family. Travellers should be very careful in this matter and show respect for members of the Royal Family, too. The same applies for all images showing members of the Royal Family. Also don’t make jokes about the Royal Family because Thai would not appreciate it. Thai people love their King. If you want to know why, just ask for the reason politely. Before movie screenings and other public events it is necessary to stand up in honor of the Thai King. If you visit religious sanctuaries, you should wear appropriate clothing. Shirtless, short trousers, sleeveless T-shirts and other inappropriate clothing should not be worn. It is OK to wear shoes and stay on the grounds of a Buddhist temple. But a chapel with the image of Buddha should not be entered with shoes. 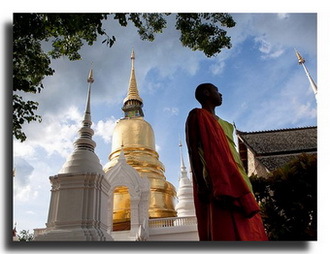 All Buddha images, large or small, damaged or not, are sacred in Thailand. Travellers should not climb on a Buddha image or do something that Thai people would not appreciate. Women should never touch a Buddhist monk. It is better to put the item on the floor or on a table within the reach of a monk, or ask a man to give an item to him. Buddhist monks are not allowed to sit next to a woman in public transport. That’s why women should not sit next to a monk in a bus, train or a car. Otherwise the monk would have to leave his place. If you are greeted with a Wai, you should Wai back. It is not necessary to Wai back to a child. Thai people greet each other by saying "Sawadee" and instead of shaking their hands, they put both hands together and bend forward slightly. For sure you know this position from people who pray. This gesture is called Wai. Never touch the head of a Thai person. The head is the most important part of the whole body. Thai people don’t point to someone with the foot. Tourists should avoid it, too. In normal houses, guest houses, or shops in Thailand, people don’t wear shoes. If you are not sure what to do, just watch the other people. If there are shoes at the entrance of a shop, you should also take off your shoes before entering. Try to stay calm during confrontations or problems with other people in Thailand. People who lose their temper in public, also lose their image for other people. You can achieve the maximum by being friendly and staying calm. Avoid disputes with other people in public and don’t criticize others. With little patience you will achieve your goal much faster. A person who forgives quickly and doesn’t spend long time thinking about inconveniences deserves respect and appreciation in Thailand. It is a good thing to learn some basic Thai words, like hello or thank you. Stay away from drugs in Thailand. People caught with drugs can be sentenced to several years of prison. Always think about smiling as much as you can.